I detailed five benefits of a college degree, and why now is the perfect time to go back to school in my last blog post. So if you read that and decided to enroll in a class or two this fall, you might be wondering how to make the most of your college experience. As an adult learner, you have a lot on your plate. Adding classes to your already busy schedule requires careful planning and ample diligence to ensure your academic success. 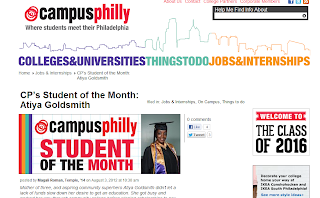 So here are seven tips to help you stay on track while earning your college degree. Create a strong academic foundation. When you start the semester, make sure you understand your responsibilities as a student. In each class you sign up for, get to know the syllabus and your professor. Understand the academic expectations of your classes and your program, as well as what GPA you have to maintain to stay in good academic standing. Be a voracious learner. 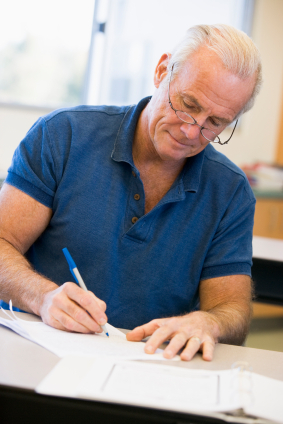 Take every chance to learn from professors and fellow adult learners, and share your knowledge and experiences with them. One of the greatest assets you have as an adult learner is your life experience, and learning and sharing with others can help you reach your personal and professional goals. 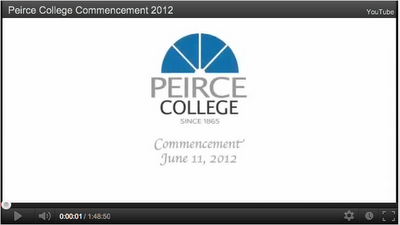 The full video of Peirce’s 2012 Commencement is in! If you weren’t able to make it to the ceremony, want to relive that incredible night, or just want to catch the graduating class walking across the stage again, our videographers were on hand to catch it all. Thank you to everyone who made our commencement ceremony a success -- our dedicated faculty and staff, speakers, volunteers, and all the family and friends who shared in this special night. And a hearty congratulations again to our 2012 graduates. You should be proud of what you’ve accomplished with Peirce and this video of Commencement embodies that. Feel free to share this video with your friends and family! If you want to share it on Facebook, just click share at the bottom of the Facebook post. As we start into August, we thought it might be a good time to refresh your memory and rejuvenate your job search by sharing a few tips and strategies for presenting the best you possible. One of the aspects of my job as Dean of Career Development Services is to help Peirce students and sometimes alumni find internships and co-op experiences, as well as to assist in the job search process. That includes imparting advice on everything from how to write effective resumes to interview etiquette and even what to do (and not to do) after landing your coveted position. Constructing and perfecting your resume is often the first step in any job search. It can also be one of the most crucial steps, as what you present to future employers has to reflect your value in a language and format that is aligned with the job or industry you’re working towards. 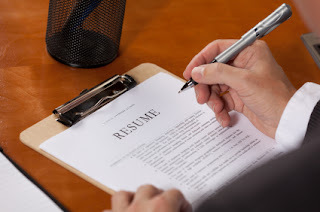 Below are a few tips for putting together the perfect resume that accurately portrays you and your abilities, whether you’re preparing for your first job, your dream job, or anywhere in between. Illustrate what you have. Focus on separate skills and job titles. I suggest swapping a vague objectives statement to a very specific skills summary that speaks to what you have done or can contribute to the job. This changes your resume from focusing on what you want, to what you can contribute. I also suggest getting away from simply listing activities you’ve done and instead using that space to qualify skills and quantify results. Not all IT jobs are created equal, especially in today's ever-changing IT landscape. With IT innovations moving at the speed of light, once-secure tech jobs are now on the verge of extinction. 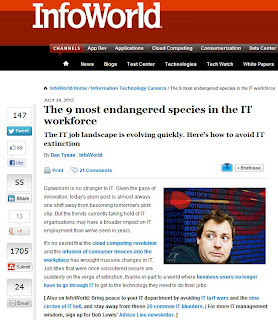 InfoWorld contributor Dan Tynan recently analyzed this trend in his article, "The 9 Most Endangered Species in the IT Workforce." He turned to me for my insights on what IT jobs I see disappearing in the coming years and how to avoid falling prey to IT job extinction. 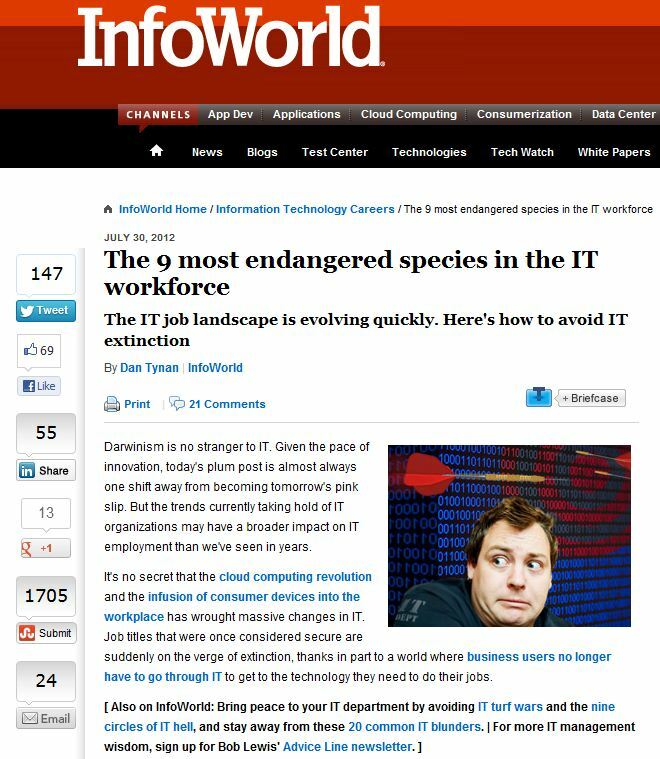 If you're interested to know what IT jobs are on the endangered species list (genus, species, and all), click over to Dan's article. You'll find some great advice on how to stay current in the fast-paced IT world.